If you turn right outside our gate and walk down past Jack Flaherty's farm you'll join a pilgrims' way called The Saint's Road. Its name in Irish is Cosán na Naomh. Its one of the oldest pilgrimage routes in Ireland. And people walk it still. The Saint's Road runs from a staring point in Ventry to the top of Mount Brandon, Corca Dhuibhne's holy mountain. The mountain got its present name from the Christian saint, Brendan, whose voyage from Ireland to America was one of the great legends of medieval Europe. But, long before the days of Brendan and the medieval monks, Mount Brandon must have had other names. Because other, pagan, pilgrims walked the same route and climbed its slopes, thousands of years before Christ was born in Bethelhem. Memories of those other, older pilgrims still survive here in folklore. They prayed to the ancient Celtic sun-god, Lugh. And echoes of their world-view still resonate in rites that are held on Brandon every year. Lugh is the god of the harvest, whose season, Lughnasa, ends with the month of October. Over the years and in different places there've been different versions of his story. Here in Corca Dhuibhne, he strides up Mount Brandon from the east, with flashing eyes and hair, and a golden spear. And in an epic battle that spirals on each year to eternity, he defeats Crom Dubh, 'the crooked dark one', releases the harvest from the earth, and gives it to the people. Each year Lugh's victory's still celebrated here in Corca Dhuibhne, when local people climb the mountain from the east, light fires, have picnics and play music. 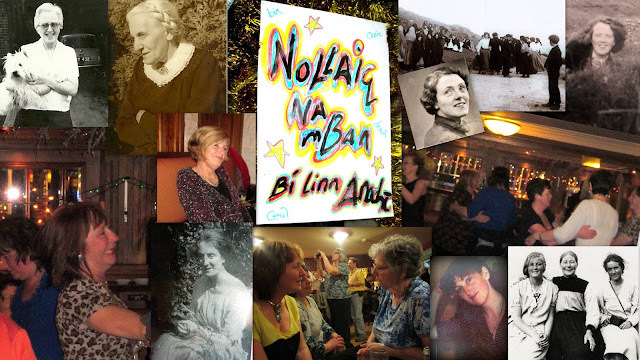 And, though the mountain's now called after Brendan, the season's still Lughnasa, and the day of the festival's still called Crom Dubh's Sunday. In the middles ages, Christian storytellers made Lugh into Brendan, and Crom Dubh into a pagan chieftain, whom the saint killed or converted. As time passed, the older beliefs were supressed by the new religion. On Mount Brandon, the pilgrim route's now marked by white stone crosses. But last week a Dingle man, called Colm Banbury, was guiding two tourists along Cosán na Naomh when he found another, older symbol. Low to the ground, carved on a rock slab, he saw a perfect spiral. 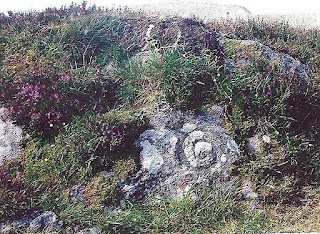 Like a coiled snake carved in stone, patched with lichen, half-hidden by heather and furze. It's the first example of Megalithic Art of this kind found in Kerry. And it's an image of the ancient Celts' vision of eternity. Thanks, Andressa. Colm Banbury was quoted as saying 'we were just taking a short break and, whatever way I looked, it was just there in front of me'. I think it's a magical find.